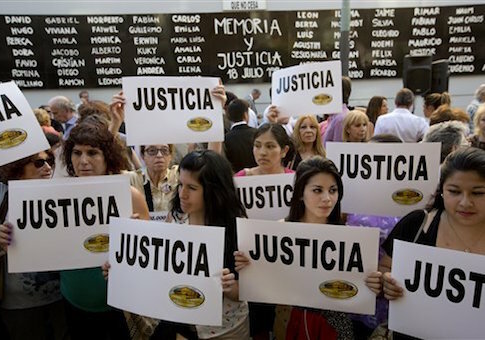 There is evidence that the Argentine government struck a deal with Iran to cover up the Islamic Republic’s involvement in the 1994 AMIA bombing, former Manhattan District Attorney Robert Morgenthau told the Foundation for Defense of Democracies last Wednesday. “It is hard to fathom a government’s willingness to cover-up the murder of its citizens, but that such a deal was reached between top officials in Argentina and Iran seems clear,” said the long-time New York prosecutor. Morgenthau, who served as the Manhattan District Attorney from 1975 until 2009, was at FDD to receive the first annual Nisman Award for Courage. The award was created in honor of Alberto Nisman, the late Argentine prosecutor who had been appointed 10 years ago to investigate the attack on the AMIA Jewish community center in Buenos Aires. The 1994 bombing killed 85 and injured hundreds of others and is believed to have been carried out by Hezbollah under directions from the Iranian government. Nisman was found dead from a gunshot wound to the head in his apartment on Jan. 19, but forensic evidence has indicated that the death was not a suicide. He died just hours before he was due to present congress with evidence that Argentine President Cristina Kirchner had agreed to grant Iran impunity for the bombing in exchange for favorable trade deals. “According to Nisman, and according to revelations that have come since his death, this was a sordid deal cooked up in backrooms and bedrooms, involving huge transfers of money between Iran, Venezuela, and Argentina, all at the expense of the innocent men, women, and children who died at the hands of Iranian-backed terrorists,” said Morgenthau. As Manhattan District Attorney, Morgenthau investigated numerous terror financing cases involving Iran, including the Alavi Foundation case. According to Manhattan and federal prosecutors, the Midtown-based Alavi Foundation acted as a direct conduit for the Iranian government, bankrolling the regime’s political and charitable interests across the United States. The organization’s assets were seized by federal authorities in 2009. Morgenthau said he first met Nisman while tracking Iran’s financial web throughout South America and the United States. Morgenthau was a U.S. Attorney for the Southern District of New York from 1962 to 1970, before becoming Manhattan District Attorney. His father, Henry Morgenthau, Jr., ran the Treasury Department under President Franklin Roosevelt, where he helped rescue Jewish refugees from the Nazis. His grandfather, Henry Morgenthau, Sr., was ambassador to the Ottoman Empire under President Woodrow Wilson. He clashed with the administration over his vocal objections to the Armenian Genocide and his advocacy on behalf of the Armenians.